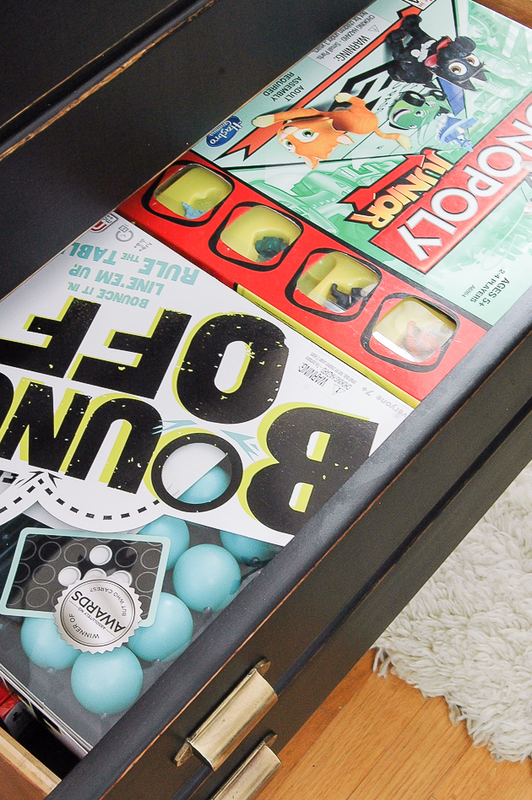 Clever and stylish ways to effectively hide toy clutter! 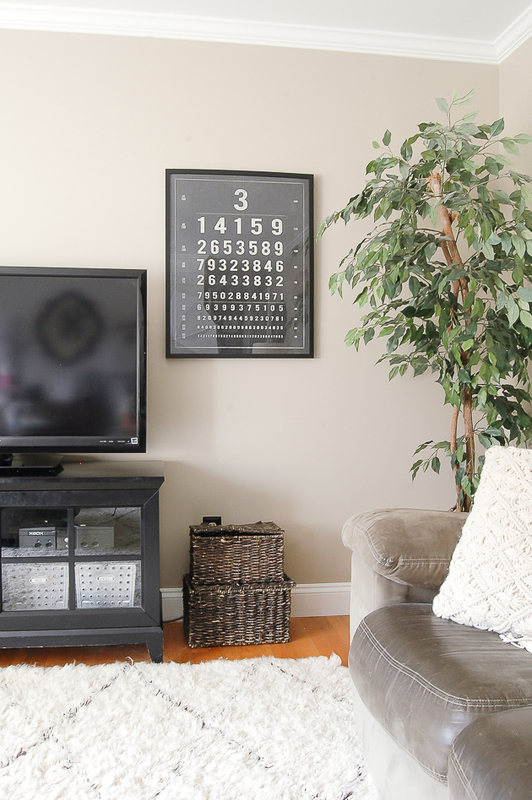 Building, creating and decorating is my thing, organizing is not. 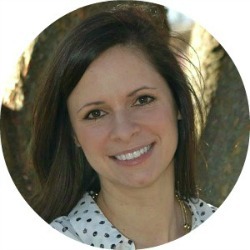 Walk into my home on any given day and you are bound to find piles of papers, laundry in the living room, craft projects on the dining room table and toys that are not where they belong. My home is small and it's no secret that I'm not the most motivated organizer. I would much rather spend my evenings blogging and creating projects over doing laundry, putting away dishes and tidying up the house. Unfortunately, this results in unnecessary stress so I'm working hard on keeping our living and dining rooms organized and toy free with double duty decor. We keep a lot of toys in our basement, but most of them end up in our living room since that's where we spend most of our time. Unfortunately, I lost the "no toys in the living room" battle years ago, so instead of fighting with the kids to take their toys to their rooms or the basement, I buy furniture that's pretty, functional and perfect for keeping toys hidden. The good thing about having a boy and girl is that they each have their own toys and rarely fight over the same toy. The bad thing is they each have their own toys, haha. Purging is definetely necessarily and essential in limiting toys, especially when you live in a small house. 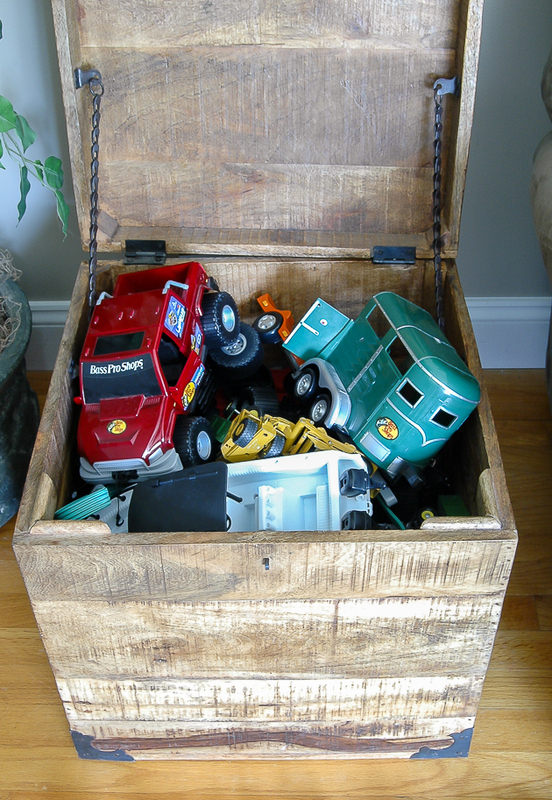 We encourage our kids to go through their toys and get rid of anything that they have outgrown or don't use anymore. We live by the rule of thumb that if the toy bins don't close then it's time to purge. Most of the time our kids help in the process and it's been a great way for them to learn the importance of giving. Lining up similar items and having them pick one to keep and one to donate has worked well for our family. I found a long time ago that it was much easier for my kids to put away their toys when they knew exactly where they went. Giving each space a purpose and designated space for art supplies, trains, board games, trucks, barbies, etc. makes clean up quick and easy. Having toys for both boys and girls results in a lot of toys. 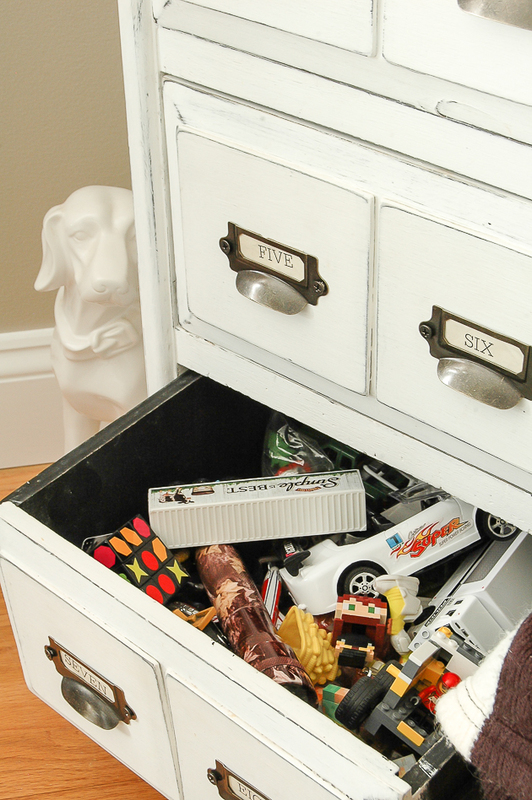 I decided when my kids were young that they would each have a few designated drawers in our living room. This way they know where their toys go when they are done playing and if their drawer/area gets full then they are responsible for purging unused toys. 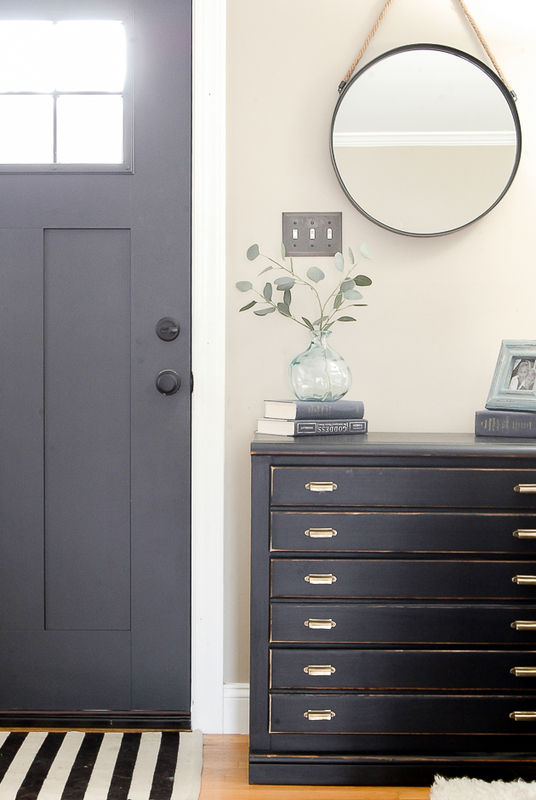 Buying and using storage solutions that are both stylish and functional is a win-win for everyone in our home. Instead of buying plastic storage carts and bins I buy furniture that doubles as storage. 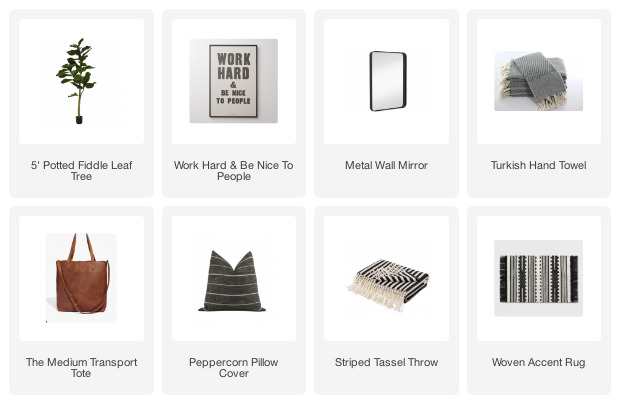 Trunks, chest of drawers, dressers and baskets are some of my favorite items to use to hide and conceal toys while also keeping our living room stylish. 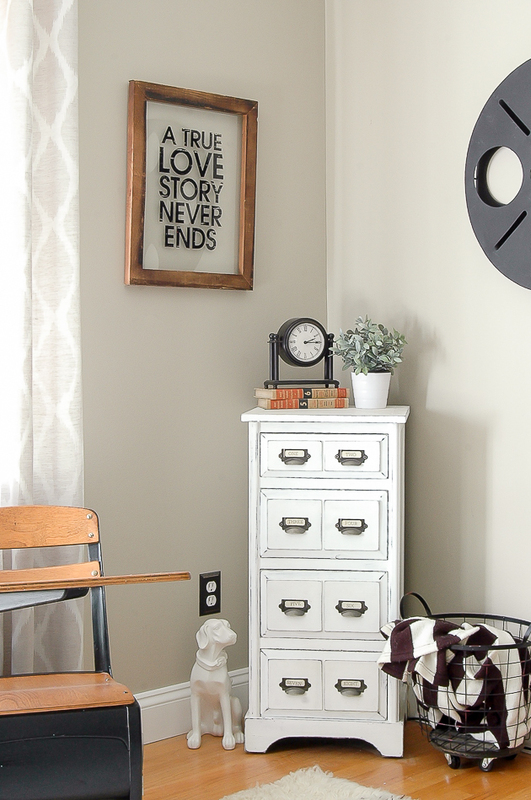 Our entryway is one space in our home that is functional and allows for a ton of toy storage. The suitcases that I updated sit on our entry table and are empty (yay!! ), but are available for toys if need be. There is also a taller basket with a hinged lid that sits to the left of the entry table that is used for storing pretend doctor supplies. I bought this gorgeous 3 drawer dresser/chest (I love that it looks like multiple drawers) from a local vintage market and it's one of my favorite pieces. The best part is you would never know that it's packed full of toys. 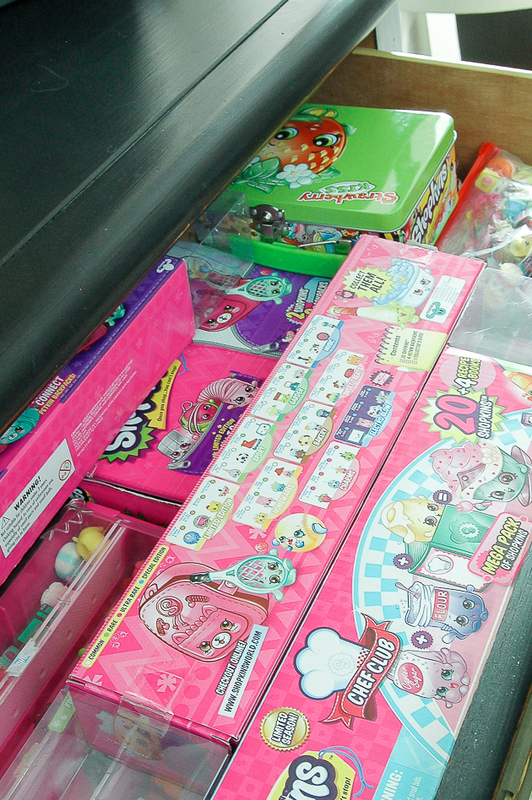 My daughter gets the top drawer and has filled it to the brim with all her Shopkins. The second drawer is for board games and the third drawer is for art/homework supplies. You'll learn quickly that I LOVE using drawers in my home. 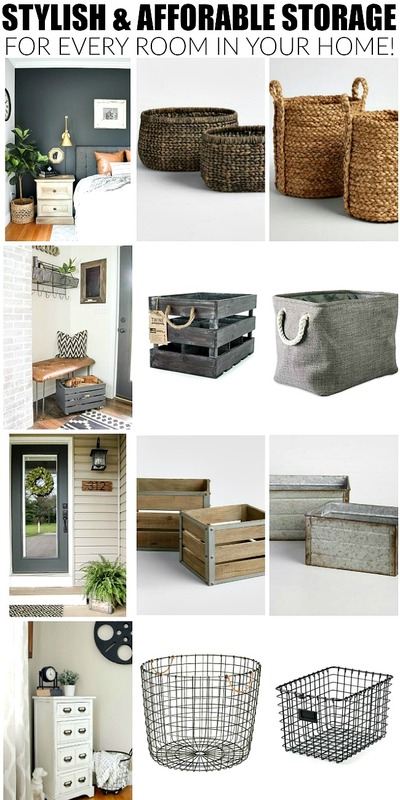 Unlike baskets and bins, drawers are impossible to overfill. If you can't close the drawer there are too many toys and something has to go. 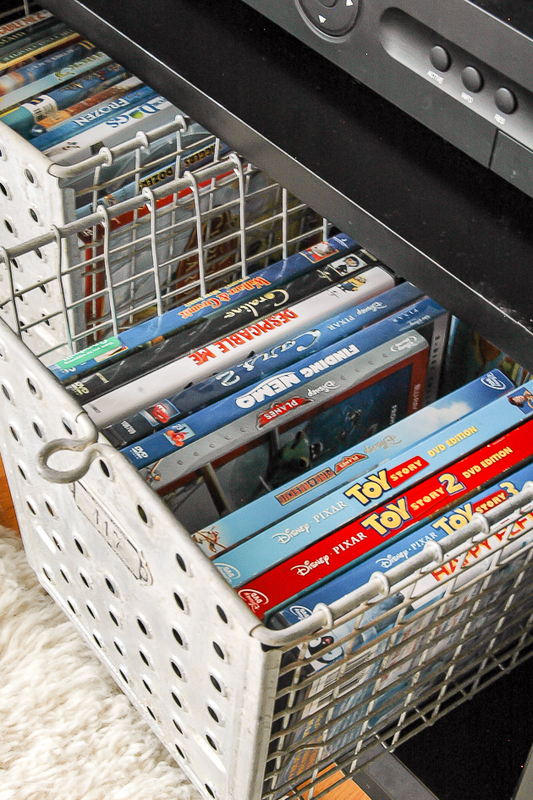 With baskets, you can simply pile more things on top creating a tower of toys and clutter. The small stack of drawers in the corner is used for smaller games and cards. 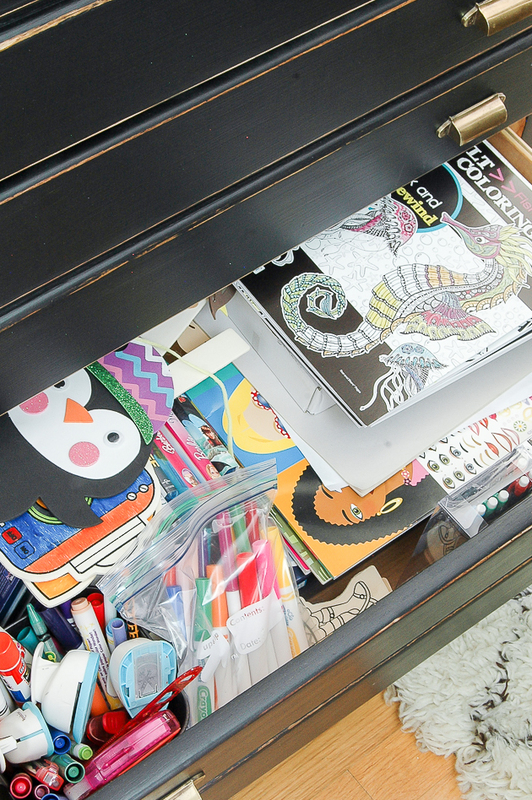 Each kid then has a drawer where they put a lot of their smaller "treasures". This is where happy meal toys and birthday party favors tend to get stored. 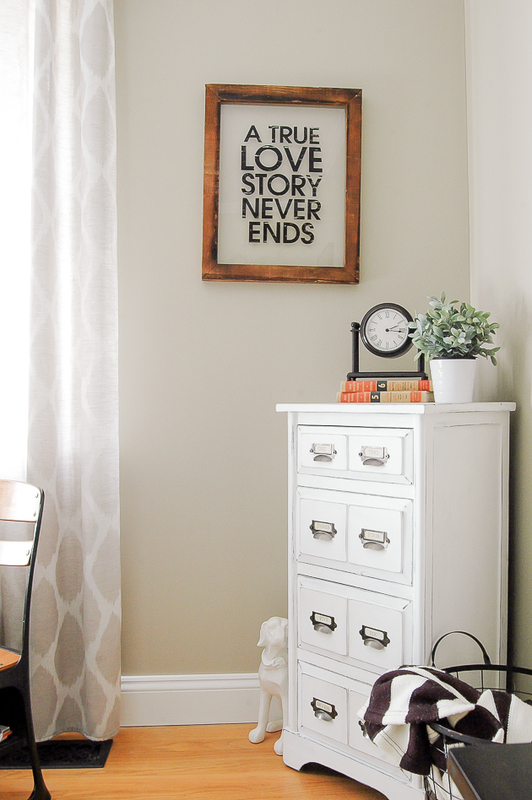 In the other corner of our living room, I have a large crate that I purchased from HomeGoods a few years ago. Again, it's hinged and has a lid making it easy to measure when there are too many toys. This is where my son keeps a lot of his larger trucks and remote control cars. It also doubles as a side table, which is great for drinks. Stacking baskets is another favorite organizing method of mine. 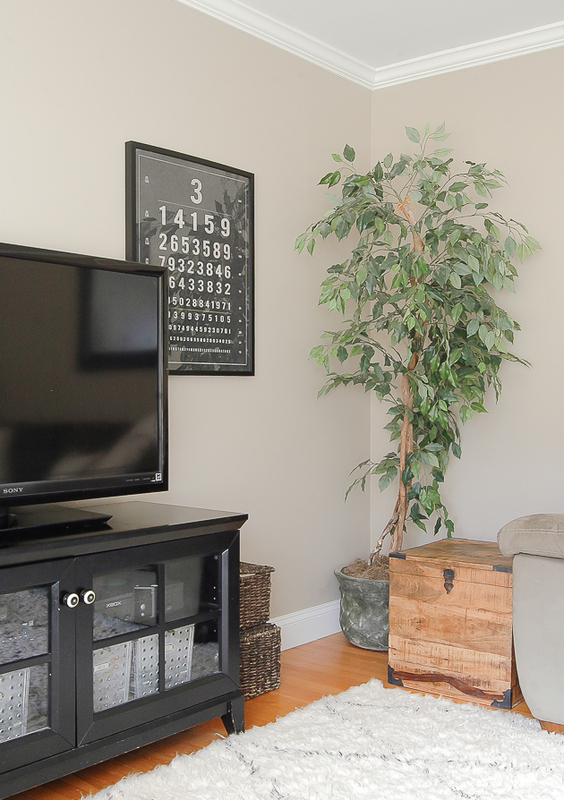 The two stacked baskets next to the T.V. store large legos and matchbox cars. Again, the baskets have a lid making them perfect for hidden storage. Are you seeing a theme yet? One of my favorite new purchases are 4 vintage locker baskets that I bought from Luckett's during a recent girls weekend. 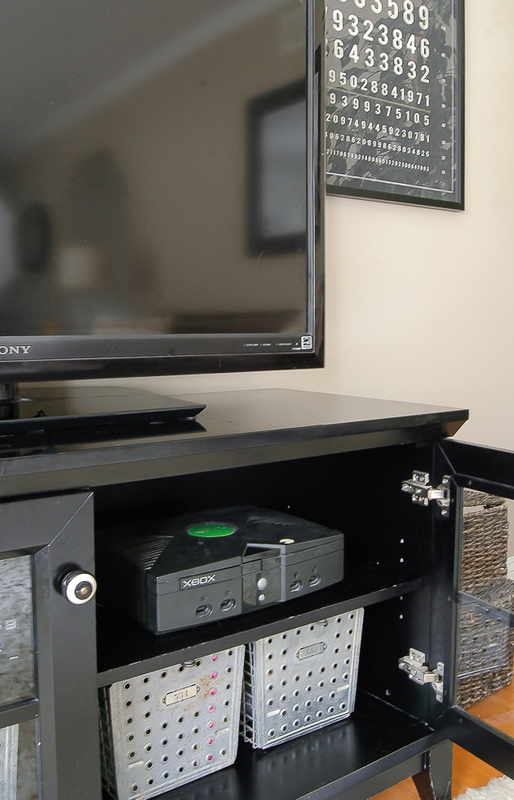 They sit inside our media console and are perfect for organizing DVD's and Xbox games. Having a house full of toys doesn't mean you have to sacrifice style. 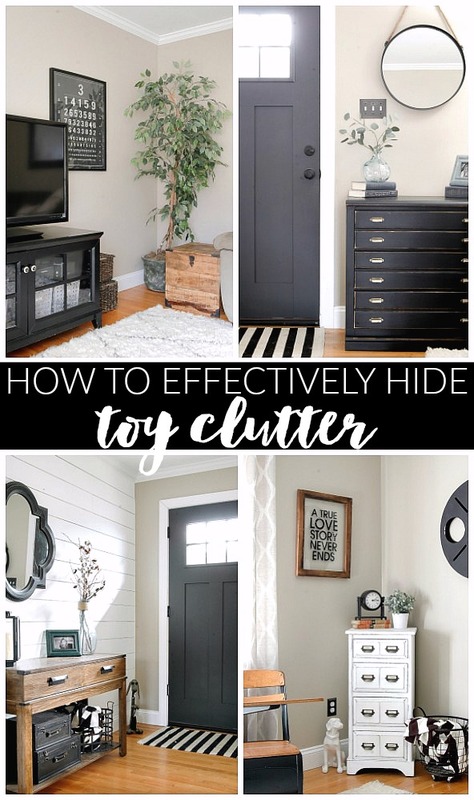 It's easy to effectively hide toy clutter by finding the right pieces that work for your home and family. I was admiring your 3.14 Pi print! Do you have a source? 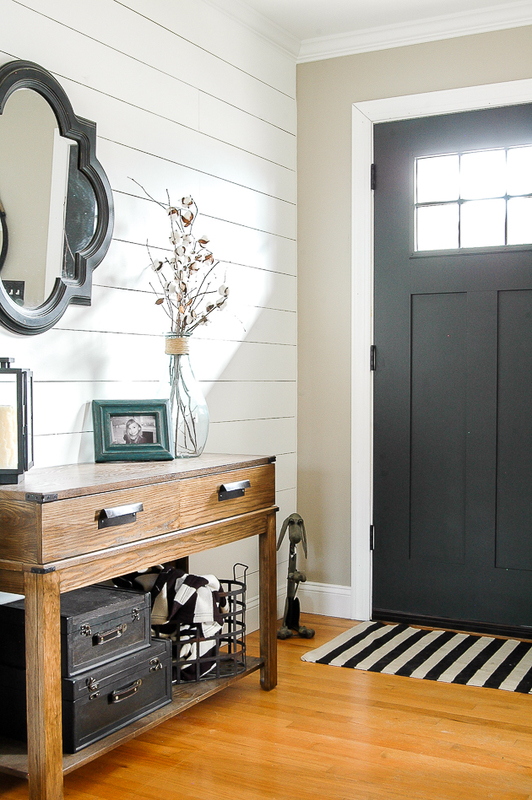 What paint color do you have on the walls? It's light but provides just enough warmth. Love it.